With Easter just around the corner now is the perfect time to start shopping for little ones Easter baskets. I always put candy into their basket, but this year I also want to get gifts that will remind my boys the true meaning of Easter. And that it isn't a day to find eggs and eat candy. It is a day to celebrate and remember the remarkable gift that Christ gave us so many Easters ago. That is why I am excited to be putting the Once upon a Time Holy Bible and Once Upon a Time Storybook Bible into my boys baskets this year. 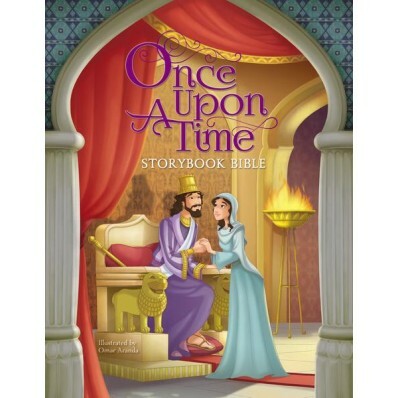 With the popularity of fairy tales and Disney animation, and especially with the new release of Disney’s live action Beauty and the Beast on March 17, Zonderkidz wanted to publish a storybook Bible and full -text Bible (Holy Bible offered in hardcover, and pink leathersoft editions) that would resonate with children and families who loved those types of movies, and loved reading a great story. What Christian parent doesn’t want to tie in Bible learning fun with what their kids already love, but also have the opportunity to teach them that the real heroes and stories of our faith come straight from God’s Word. I am excited we have a few "themed" children Bible in our home and they are always a hit with my boys! It gets them excited to read the Bible. The NIrV Once Upon a Time Holy Bible highlights six great stories from the Bible on 24 full-color inserts. Each story is told on four pages in full-color, illustrated splendor, and contains the complete text of the New International Reader’s Version (NIrV).